Matching wedding bands, from curved rings to plain comfort fit rings, are available to fit a variety of engagement ring styles. If you already have an engagement ring, and you are searching for a matching band, use these tips below. 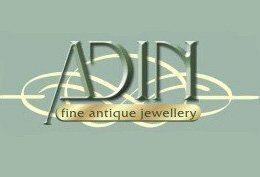 Here you can also find answers to questions visitors have sent in about locating matching wedding rings - and if you have any questions which are not answered here, just send in your questions through the handy comment box at the end of the page! 1. Try on different types of matching wedding bands - including curved bands - to find one that fits perfectly. This process can take awhile, and you may need to visit different retailers before the right match is found, but eventually you will find one that works! 2. 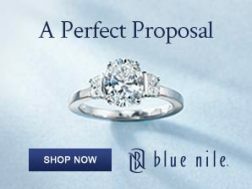 Have a local jeweler - or even an online jeweler - craft a matching band that will be an exact fit for the engagement ring. 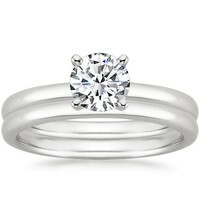 Try to stick with a band that matches the metal and karat of your engagement ring. So, if you have a 14k white gold ring with rhodium plate it is best to go with a matching 14k white gold ring with rhodium plate. Many engagement rings have high raised settings, so the matching wedding ring does not necessarily need to be curved to fit the band. 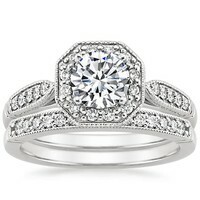 If the diamond or gemstone in the engagement ring is raised, a plain comfort fit wedding band might be the best match. 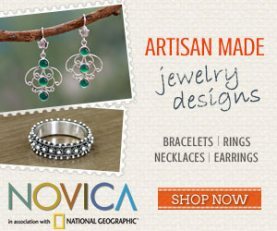 Choosing a local jeweler to craft a matching band can be the best option if your ring has a low gemstone or diamond setting - or if the ring contains a gemstone with a somewhat unique cut, like a heart or pear cut. 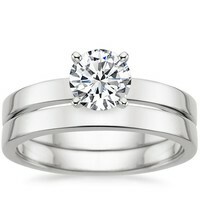 A matching wedding band often looks best if it is the same millimeter width as the engagement ring. 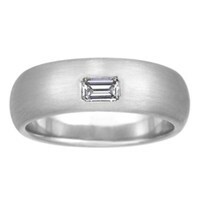 However, if the engagement ring is especially thin a thicker matching band could look quite nice too. If you want to add a little extra flash to your wedding rings - choose a matching band with diamonds or colorful gemstone accents. 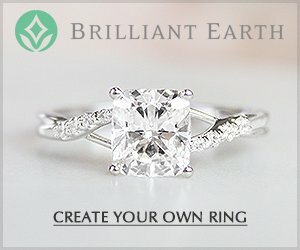 What is the Best Wedding Band to Match Mother-in-Law Engagement Ring? 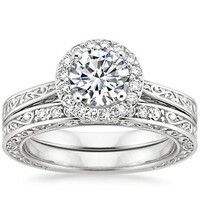 I would like to know what type of wedding ring band would go best with a V-setting solitaire diamond ring, with one small side stone on each side of the large center stone. 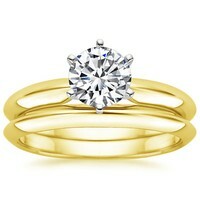 The engagement ring is 14K yellow gold with a four prong white gold setting. The band has a plain style on the sides. Could you give me some options and your best opinion? 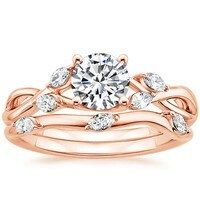 I would prefer something simple but not boring – like the bands with small diamonds on the top portion of the band (not all around, but just as an accent). The ring is on the thin side – guess around 2mm – it is my mother-in-law’s to be wedding ring. I’ve also seen the half diamond bands that arch upwards toward the center stone – so high set the stone isn’t sticking up alone. 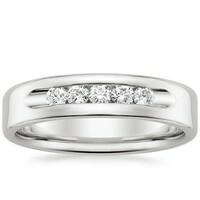 But I know that I want a wedding band that can look great when I wear it alone only too. 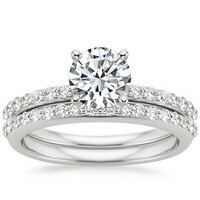 I am assuming by a V-setting that you mean a V prong setting on the diamond? 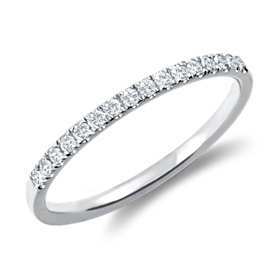 To start with, the best band should closely match the size of the engagement ring – between 2 to 3 mm wide. Ideally, so the colors of the bands match, the matching band should be 14K yellow gold as well (18K gold often has a color which is slightly different than 18K yellow gold, it is sometimes described as a slightly richer yellow tone). 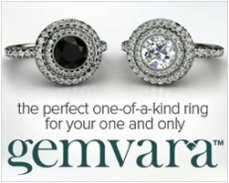 Small diamonds are an excellent option too - but it is important to ensure that the diamonds will not rub against the other ring. If you want a wedding band that will look great on its own, styles with raised or slightly curved features could look a little off when the ring is worn alone. 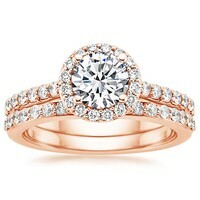 In this case, it would be better to stick with a straight comfort fit band that will fit well with the engagement ring too - with perhaps a few diamond accents on the side. 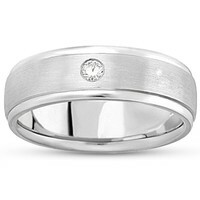 I am looking for a wedding band for my fiancée that has a groove at the top of it so her engagement ring stone does not sit on the top of the wedding band. There is one big stone and another dozen around the base and on top, and I need to find a band to go with it as the wedding is set for July 15, 2011. 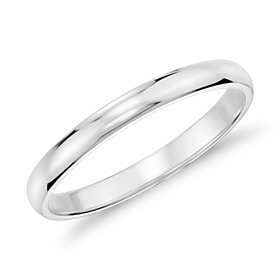 You may want to try looking for a curved or grooved wedding band through a company which offers a 30-day refund. Then, if the band does not fit her engagement ring, you have 30 days to return it for a full refund. Alternatively you could also speak with a local jeweler about crafting a matching band to exactly fit the shape of the engagement ring. 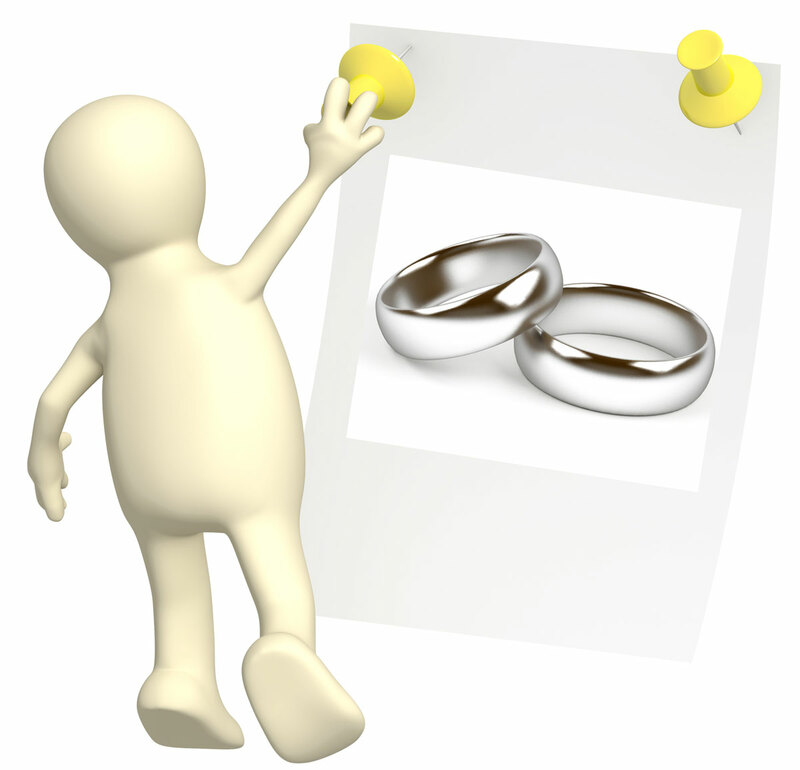 This way you can be sure the ring will fit, but if the wedding is set for July 15th you’ll need to find a jeweler soon to make sure the band can be finished in time for the wedding! I hope this information is helpful – good luck and congratulations to you and your fiancée on your upcoming wedding. Curved Wedding Band for Sapphire Cut Engagement Ring? I have a princess cut sapphire engagement ring. A straight wedding band does not fit. 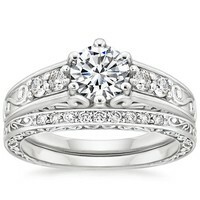 What type of curved wedding band would fit the princess cut? The best type of curved wedding band for your engagement ring is either a contour band or a curved band that has a slight depression in the center - to leave room for the center stone on an engagement ring. To find matching wedding bands that will fit your engagement ring, visit jewelry boutiques which have curved bands and try on different types of bands to find bands which are comfortable and fit around the center stone. You may also want to talk with a local jeweler about having a custom band made to curve around the center stone on the engagement ring. In many cases, a custom made band will cost the same - or just a bit more - than a band that has already been created, and with a custom band you can get an exact fit for your ring. Hope this info helps, and do contact us again if you have any additional questions! 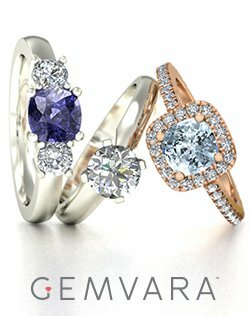 Do you have comments or questions about matching wedding bands? 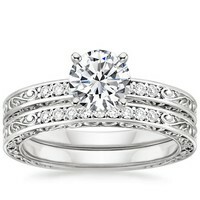 Send in your comments, questions and reviews about matching bands or upload pics of your matching rings to share here! 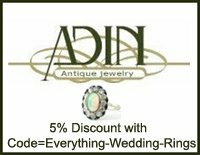 See EWR's favorite Estate, Vintage and Antique Ring Finds at Adin Fine Antique Jewelry! 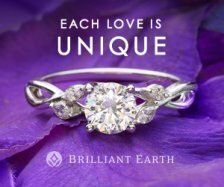 Top Diamond Wedding Ring Picks by Brilliant Earth!